John E. Blackford enlisted in Company H of the Second Kansas Cavalry on September 20, 1862. John was the younger brother of William D. Blackford, who was part of Kansas Territory's free-state government and a member of the first Kansas State Legislature in 1861. 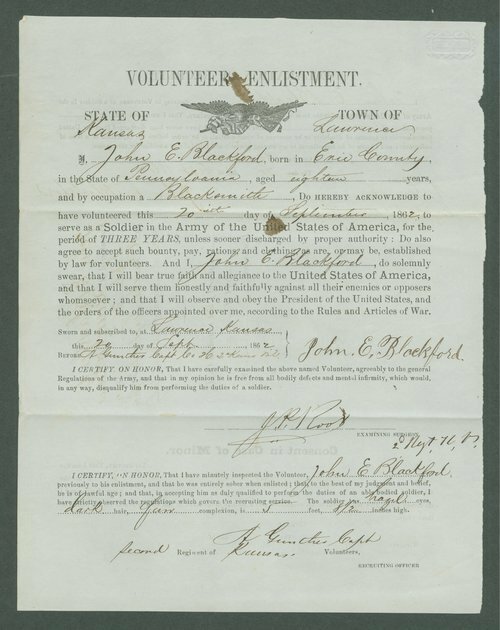 This example of a Civil War enlistment is from the records of the Kansas Adjutant General's Office. It gives the soldier's age and place of birth, his occupation and a physical description.